Ah, now this is more like it. 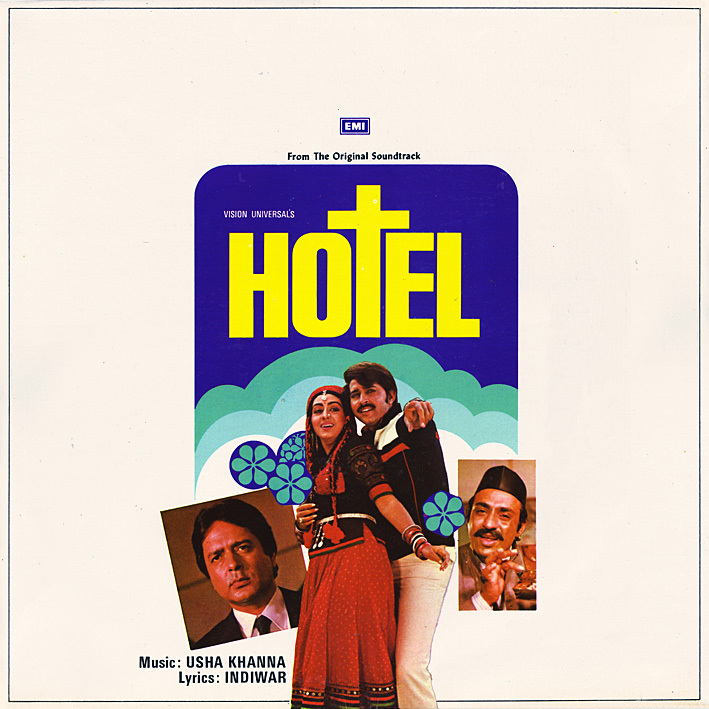 'Hotel' is another horror movie (produced by the infamous Ramsay Brothers), and while there's no apparent fear and trembling conveyed in the music here either the soundtrack is much better than 'Jaani Dushman's. Atmosphere, character, diversity… and top songs. Pop songs; Usha Khanna has a wonderful knack for writing unassumingly catchy tunes and this album has several. The floaty 'Pyar Karte Hain Ham', the cool and funky 'Tere Jaisa Pyara Koi Nahin', the beautiful 'Jeena Hai To Jee Bhar Hanslo' (I prefer the female version), the bittersweet sounding 'Dekho Pyar Men Aesa Nahin Karte' and the frenetic 'Kaun Yeh Aaya Mehfil Men'… I really can't fault any of them. Lots of playfulness in the song arrangements, and two short but awesome instrumentals as icing on the cake; this is about as perfect as it gets. No reups; when they're gone they're gone. I thought you'd posted "Hotel" before, but thank you! I've not heard many of hers but the ones I have I've generally liked. I don't rate this album even just near to "Jaani Dushman' which has far better songs of every blend of music. Jaani Duhsmna was the first movie which got huge success mainly due to its fresh music whereas Hotel was a flop one and its music could not support it despite the fact few songs are really good. [opinion may be differ] anyway thanks for this album I too think you have posted it earlier and I have this album already. It came into my possesion a few weeks ago, so I definitely haven't posted it before. Thanks PC for this wonderful score. But the sound quality was not good. AH, that's probably where everyone remembers it from then.